This is by far my favorite Ambush map. I enjoy the balance between open spaces and close quarters battle within the compound. Would love to see more urban enviroments in future maps. This map is too large for 16v16. Once we get 32v32 thus will be more fun. Also the lag is horrible. Thank you for removing this map until the frame rate issues are fixed. Have ye removed the top northern section(Point A, a CRU, and a depot) from being playable, or is it just the highlighted area shown is incorrect. --We are also missing the fifth map we used to have, where it had B and C in a compound, C in the building with a cloner near by. I loved that map, allowed me to shut gun really effectively. That was the same map as this but with different modules in the slots. No need for a section for each configuration of the same maps or we could eventually have dozens of these sections. the ambush portion of this map is far too large and could prove a problem with corp fights. all the default spawns are in and around the city. if an entire enemy team were to pick up and move to the western or eastern edge with drop uplinks and nanohives and just camp there would be no hope for the enemy. all they would have to do is get their snipers ready and swarms for any vehicle. the skirmish part is fine, no spawn camps pretty decent map. Ye, I've had some great fun on this map. Somewhat urban combat mixed with the more open battlefield stuff. I think the map you're talking about was removed while they try to sort some problems with it. Yes this is also a fun map, but have experience much lag on this lately. Loved the layouts of the turrets, crus and supply depots. Added with the terrain it really made it so that capturing the objectives was only part of the battle. A well organized rally from any hackable structure could really turn the tide on this map. High Res link broken here as well. This map may be a bit spread out for ambush with 16v16 teams, reducing overall conflict and pacing of the match (more likely to deplete game clock than clones). 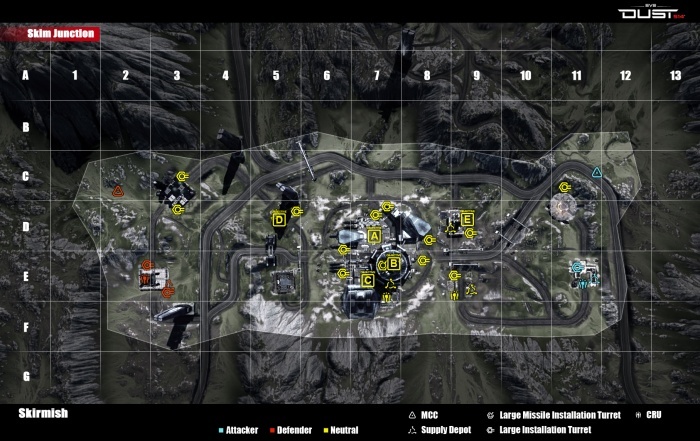 One of my favorite maps, rewards team play and diversity of squad/team deployment. Calls for more battlefield awareness and tactical adaptability due to the distribution of resources (i.e. various hackable objects) and the distance between them. I've seen the lead on this map change hands many times in one game, and often due to one squad (or even one player) having the awareness to flank or push at the right time (as opposed to being locked into trench warfare or over focused on capturing a specific point). Conclusion Ambush might benefit from a bit of a truncation of this map. In Skirmish however the size, sprawling layout and rich but diffuse hackables makes this one of the most interesting maps to play on. I like this map the most cause I feel its more balanced than the others but it suffers from really bad lag when it uses a specific large structure in the middle. Great card but the base Galante I liked more, it seems Caldari base or factory. In the future, I want to see places deserving of our deaths! I really like this map on Ambush. Seems every time i go here (which is rare for some reason (I've only been here maybe 5 or 6 times?) i find a new Niche of the map i didn't see before. There's alot of corridors where you have to go slow to avoid detection and try to flank your enemy. Then there are open spaces where People below you (or under stairs) can shoot at you without you knowning they are there. On skirmish i feel like the 3 points outside of the Large facility didn't get much love. D and E look exactly the same... not to mention they look kidna odd and like they're begging to be camped by snipers who have no love for me and my fellow Logibros. Then A which looks kinda like a Small town comparable to Objective A in Harvest Line. The null cannon is seperated at somewhat equal distance from 2-3 buildings. only it's alot more flat and approachable so it's very difficult to protect. Esspecially since the place you have to stand to hack it doesn't face any of the buildings and instead faces out into the open. Overall though i'd say it's a good map. Just awkward. Isn't this the map with a random turret spawn on top of the large circular building. @OP Right side of image needs to be reverted to previous layout as it offered superior cover and could be played strategically. Agreed on both counts. Lag was bad AND map is too big for 16v16. Map would be MUCH more fun if they can eventually get the player count up to 24v24 or even 32v32. As it stands, there's too much running around, not enough action. If the player count can't be brought up, my suggestion would be to find a way to make the map a little narrower. It's essentially a rectangular shape. Make it a slightly slimmer rectangle. This would force more action by funneling people into the letters, and creating what would be a "battleline" where a letter can be contested. You'd still be able to sneak behind said line to capture a letter, but it would be tougher. The large railgun turret by objective E need's looking at, right now i use it as my first point of call in any fights as it's got an amazing view of almost the entire map and allows you to take out 5 large turret installations right at the start of the game for 500 warpoints before anything even really gets off the ground, that's a huge advantage to anyone with that alone taking about 2-3 mins and providing something like 15% of the total WP required for a precision strike. Even now, with the OB increased cost and reduced WP gain i can sometimes get in 3 OB's on this map playing with randoms and not playing as part of a squad. I agree map is too large for 16vs16. map lags alot in ambushes for me. along with the skyfire cannon. That's not a sky fire cannon. Those are much bigger and target ships in space. The version of it with the smaller structure in the middle is my personal favorite as an LAV driver- driving around B is the only place where a blaster turret is better than a missile turret. I feel like the center complex should be expanded. This is by far the best CQC map and has the best complex area because of how intense and local fights can be. I think that if expanded, it could be a little more vehicle friendly and open up a whole new book of strategies. I figure that a multi-level system would do this area good, but no higher than three stories max. My favorite map for Ambush. Lots of cover and mid-range firefight are fun. The lag is a huge issue, though. sometimes the lag is so bad I can't even move. Multiple stories should definitely be taken into consideration. i haven't played this map but i did play one similar to it in a previous build where the attacker had to hack/destroy targets A and B to unlock the rest of the map which had points C, D, and E although i think once the original A and B were done they just named the 3 new points A B C instead of C, D, E that map kind of gave it a MAG feel in that the attacker had to open up the remaining points to be attacked... and those points needed to be held until the MCC docked... it is the opened up part that has this similar layout that one had previously mentioned... would be nice if they could bring that old map back as well as this one and fix the lag issue if that is all there was to it. The skirmish variant of this map is by Far my favorite map, it's balanced between either side (a problem i see a lot with other maps) , not easy for any specialty, and over all a great template for maps like that. My only concerns for it (skirmish) is that it sometimes feel to big and you feel completely helpless when you are getting hacked across the map. I Have found collision detection issues around the road dividers in grid location D7. When Crouched and you try to go around them you have to walk prob two feet from the side inorder to get out around them. Not sure if anyone else has had or seen this issue. Specializing in crushing people with an LAV, this map is no fun, but it has not come up enough for me to grow found of its close quarters combat. I did try to enter with the LAV from the broken ramp at the south-western edge of 6D, but I fell onto an edge of a broken firey container thing, which caused my LAV to run out its life and explode, like the fire was burning it? I am not sure if that is an intended thing, or not, so I'm mentioning it. As I recall driving onto other buildings in the past without auto LAV-life depletion effects, and getting stuck many times without such effects, even as a teeter-totter on blockades, and it never ran the life out of the vehicle before, so I am unsure of the implication of that one time, when I tried to javelin myself into that area. Now that the framerate issues are gone in the ambush variant, can we get the skirmish variant back on this build or will it be available once we move to TQ?